StorDigital Flash Media copiers have been developed to service the needs of a growing market for digital distribution via solid state drives. USB, CF Card and SD card are being increasingly used for both business and marketing purposes. 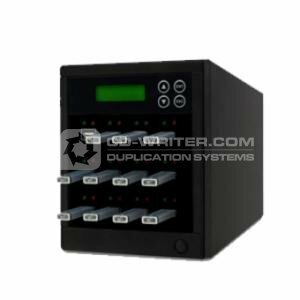 StorDigital Flash Media duplicators use the latest technology to ensure the highest level of service via an easy to use interface that will allow the operator to copy high volumes of card based media products. Whatever your duplication requirements, be it USB, CF or SD card; talk to StorDigital Systems and we'll ensure you find the right solution. StorDigital is the name to trust for duplication. New Secure Erase: Fully erase the USB device without the data being recovered. Auto-Counter Technology: Displays the total number of discs successfully copied compared to desired output for each project. User friendly interface with 'easy-to-read' LCD display: Offers easy to recognize and use terms and operations on the LCD display for simple usage. Aluminum Case used to provide a highly functional and attractive exterior: Duplicator casing available in midnight black aluminum casing. Fast Key Support: 4 fast keys for faster operations. Power on Self diagnostics: Keeps the duplicator functioning optimally. Device Info feature: Provides the detail information of the USB device. USB Prescan feature: Able to scan the source USB device for physcial reading error. USB . Duplicator . Copier . 13 . Target . StorDigital . Systems .